While rates are on the rise in a competitive environment, such as an RFP, it will take time before ECRs are increased across the board – especially at the large money center banks focused on shedding deposits rather than attracting them, says Redbridge’s nationally recognized treasury expert, Bridget Meyer. Should corporate treasurers expect a corresponding increase in the earnings credit rate that their banks are providing on average daily collected balances? Is this the beginning of an increasing interest rate trajectory that could lead corporate treasurers to consider alternative yield-capture instruments (e.g. hybrid accounts, hard-interest accounts) that are more beneficial than analyzed checking accounts? In fact, taking a step back, let’s ask a more broad question: how and why did ECR even become part of the overall corporate bank fees and yield equation, and how does it fit into a global economy? In order to answer the first two questions, you must first know the answer to the third: The concept of an Account Analysis (and therefore, ECR and the offsetting earnings credits stemming from ECR) is not normally recognized by banks outside of the United States. There are some large US-based banks that will offer earnings credits to their US-based clients on balances in non-US bank accounts – if you ask for it. Some banks are even using it as a market differentiator and calling it ‘Global ECR’ or an equivalent term. ECR only exists in the US (instead of a traditional interest rate) as a result of Regulation Q, which prohibited banks from paying hard interest on commercial deposits being held in Demand Deposit Accounts (DDA). What is (or was) Regulation Q? It was a regulation that came into being during the Great Depression in the 1930s, as part of the Glass-Steagall Act of 1933. It specifically prevented corporations from earning hard interest on their demand deposit bank accounts. It is important to note that for several decades, corporate clients were not paying transaction fees for activity occurring in their DDA accounts. From a profitability perspective, the interest that banks were earning on balances that corporations were holding in their DDA accounts more than offset the costs to the bank for the transactional activity occurring in those same accounts. However, as the interest rate landscape changed and different investment instruments became available (specifically in the 1970s), corporations shifted balances away from DDA accounts into these alternative interest-bearing accounts; as a result DDA balances dried up. The impact of this was a reversal of fortune; the associated profitability between the interest that banks were earning on DDA balances was lower than their internal cost for processing transactions in those same accounts. The banks’ answer was simple: begin charging for transaction fees. Corporations though did not sit idly by and allow these new expenses to hit their income statement and reduce their own profitability. They rebelled and demanded to see how these fees were being calculated. The ‘Account Analysis Statement’ (and ECR) was first produced in 1978, when banks, in response to pressure from their large corporate clients, shared their own internal profitability analysis used to determine the target DDA balance needed to offset transaction fees at the account level. The analysis showed that the level of ‘Compensating Balances’ required to offset service fees at current market rates without technically paying hard interest on commercial deposits. Analyzed checking accounts have been a mutually beneficial win-win ever since. So why do we now question the future of ECR? It is because of the combination of Regulation Q being repealed in 2010 as part of Dodd-Frank regulations, and Fed rates finally moving higher. Legally, there is no corporate benefit in having ECR exist anymore. If banks are no longer prohibited from paying hard interest on corporate deposits in the US, what is preventing them from converting all commercial clients to simply earn hard interest on DDA balances? Nothing except technology and habit. Billing systems that were customized to produce account analysis statements would have to be reconfigured to calculate and offer hard interest instead. In fact, most major banks have already come out with what they call hybrid accounts, which calculate the amount of compensating balances needed to offset transaction fees (treated the same as ECR and earnings credits), , and then apply a hard interest to any additionalbalances after all fees have been covered. These products were first created in 2011 and have been fine tuned since; however corporate and bank adoption has been slow. Few corporations have enough balances in the current rate environment to offset all transaction fees and benefit from a Hybrid Checking account. However, as rates rise, the adoption of hybrid accounts or corporate interest checking accounts could eclipse the usage of traditional ‘analyzed checking’ account we know today. Finally, to address the first question: are banks finally increasing ECR? Our market intelligence and experience confirms that ECRs are in fact finally on the rise – but not for everyone. In recent RFPs, Redbridge has been pleasantly surprised to learn that the banks that have not budged on rates in the past 3 years are finally coming to the table with higher ‘exception’ ECRs that are attractive. ECR continues to be used by banks more and more to lure new clients that have significant operational balances, even as those same banks look to shed certain non-operating balances due to Basel III. The difference between the typical ECRs offered by regional banks compared to those offered by global banks show a stark difference. The hypothesis being that the profitability structure of smaller regional domestic banks are different, especially as these same regional banks do not have to contend with the restrictions of Basel III, allowing them to offer the higher ECRs as a considerable differential benefit. 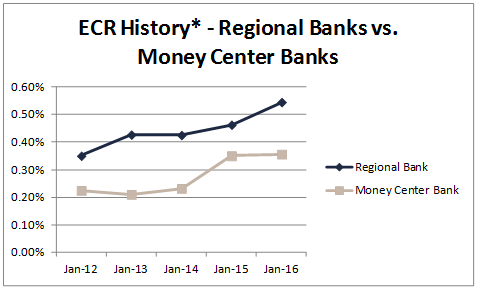 The following chart shows the progression of ECRs between these two groups of banks in the past 5 years. While rates are on the rise in a competitive environment, such as an RFP, it will take time before ECRs are increased across the board – especially at the large money center banks focused on shedding deposits rather than attracting them. Irrespective of who is benefiting from the rate increase, it is encouraging to see that rates are demonstrably on the rise, regional banks are still providing very attractive exception rates, and the future of ECR appears to be safe… for now. Bridget Meyer is a nationally recognized treasury expert in the field of bank relationship management and account analysis. Bridget actively manages and promotes the AFP Service Codes Accredited Provider Program designed to increase standardization in bank fee reporting and authored the AFP Global Service Codes. At Redbridge, she is responsible for overseeing all debt and treasury advisory projects in North America. She earned her CTP certification in 2007.